I'm super excited because not only is my birthday two weeks away, but this month marks the one year anniversary of my launch of Above the Bottom Line's Patreon community. To celebrate, I'm offering a special promotion up until my birthday! For those of you unfamiliar with Patreon, simply put: it's a way for individuals to support content creators they love. Most importantly, it's the best way for you to support the success of ABL. My goal is to hit 250 patrons by Oct 14th , will you help me get there? 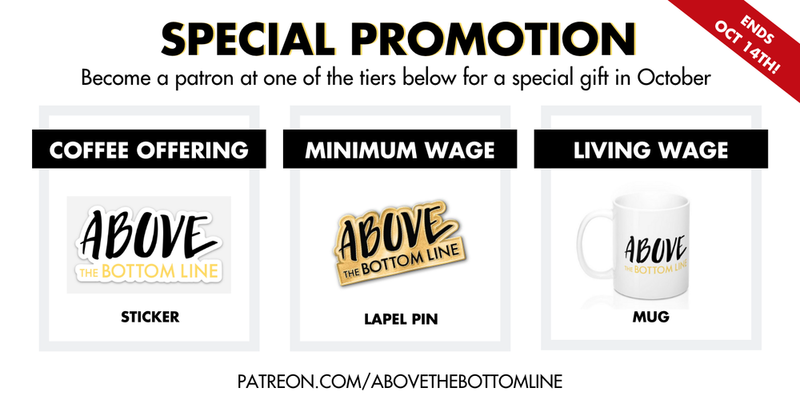 To become a patron: visit patreon.com/abovethebottomline, select your preferred level of contribution (starting at $1/mth) and voila! Plus, if you become a patron at the Coffee Offering, Minimum Wage or Living Wage tier, you'll get a special gift in October. I absolutely love what I'm building with Above the Bottom Line, and I have so many aspirations. I can't think of a better way to celebrate than growing this community so that we can have even greater impact over the next year. If you love ABL too, please join me in achieving that goal. "I am a Patron because I love supporting others as they step out and do the things they love and are passionate about. There is something exhilarating about stepping off a ledge and actually being caught (in this case, financially) by people who want to see you win. Everyone should experience that at least once in their lifetimes. I also wanted to contribute to new voices discussing trends and happenings that matter to me."